Paw-licious is right…take it from me AdoptedMomToChazz… the dogs all did – right out of my hand! Ingredients: Made with oats, all purpose unbleached flour, rye flour, all natural creamy peanut butter, fat free skim milk and unsweetened carob chips. So I got this idea while preparing for BLOGPAWS. 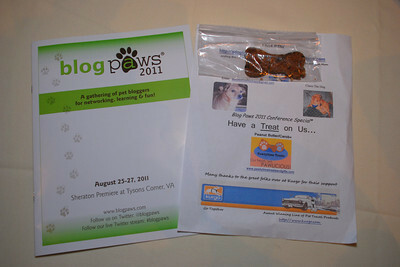 I would attach a dog treat to a flyer promoting my blog site. But which treat?….there’s a gazillon out there. Then I remembered some I’d purchased through a special on doggyloot – Bingo! These were a hit, ask any dog attendee at the BlogPaws Conference. The minute they came out of the plastic baggie, you could smell how good, wholesome, & fresh they were. The Pet Moms & Dads appreciated that. Pawty Time Treats has a variety of natural flavored treats as well as an entire line of specialty baked goods for your dog! 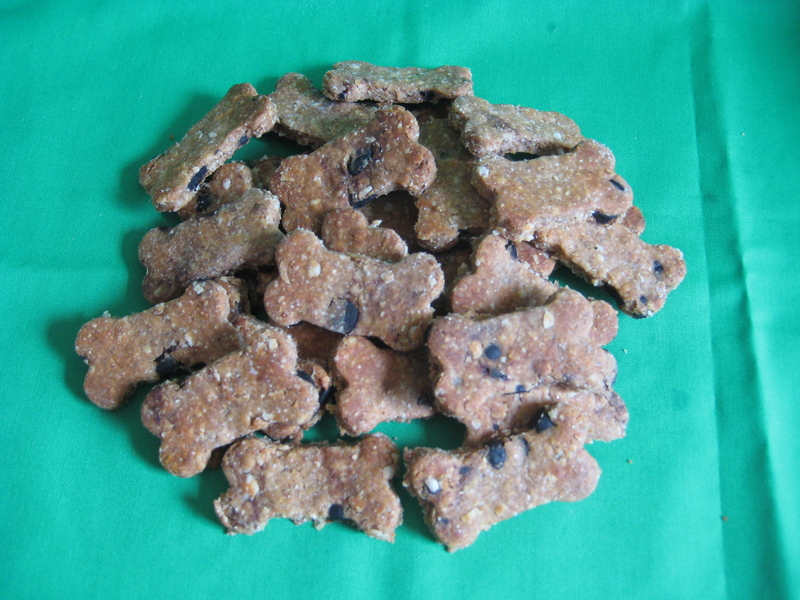 These treats are handmade with careful attention to dogs nutrition-related needs. Large & small dogs both ate this treat up. Even a ferret enjoyed some small nibbles! That pet parent sought me out the next day to tell me her positive feeling about these treats, as I learned some ferrets have delicate tummies. AdoptedMomToChazz strongly recommends this product. Review Attribution: AdoptedMomToChazzTheDog did not receive any compensation for this review. AdoptedMomToChazz purchased a 1 Lb Bags of these treats. The opinions expressed are those of one individual; and were not influenced in any manner from the outside. Constantly consult a physician in advance of setting up a brand new exercise program somanobolic muscle maximizer review I am going to be a junior in high school in a month when school starts and I want to start looking at schools. I am really interested in creative writing and literature. What are some good schools for that? I also want to study philosophy. . . Thanks!. I would never order from Pawty time treats. We are a 501C greyhound group and ordered from this organization. We expected the treats for a Christmas party they never arrived, we contacted the sller on many occasions she wrote back that they were on the way but REFUSED to give a tracking number even though we paid EXTRA to get them in time. We had to file a complaint against the company finally got our money back. This company took advantage agsinst a 501C company and never delivered a promised product. We had another adopter that ordered the treats got them but they were broken and some had mold on them, this is not a company to be trusted. I would not reccomend buying from this company. Thank you for taking time to leave a comment at my blog. I am surprised to hear about your experience with this company. I was met with support, quality product, an overall good experience. I used these treats at my Farmer’s Market booth as well as a promotional piece for a pet bloggers conference I attended last year. I respect your story & understand your admonishment to not patronize this company. If you get poor service, particularly as a 501 C that is unacceptable. My experience was considerably different. Everyone I gave these dog treats to loved them and wanted to purchase more from me. I’m not sure what else to say except please come back and visit my blog. We work hard to post entertaining, educational material, as well as some fun GiveAways. Pet parents really seem to like our work. Well, I certainly get it. But notice, I am actually not actively promoting this company. That review was posted back in September of 2011. Are you certain this is the same company? I’m having a hard time these people being so callous as to treat you & others so badly. But I guess that can happen.. I just went looking online for them and it appears maybe something drastic happened. They have reduced a lot of their online presence, so maybe they have been experiencing tough times. Don’t know. Anyway we appreciate your willingness to continue to give our blog a chance. It is important to us and our reputation that hoomans can depend on our reviews — when considering purchases of goods and services for their pets. That is just one of the reasons we exist as a blog. Have you checked out our Book & Film Reviews? We have a GiveAway going right now for a hilarious dog themed book you might enjoy to give as a holiday present or keep for yourself. We are grateful for your insights and keeping us informed of your experience. Unfortunatly it is the same company. I found your sight by doing a search on the company when we went through this terrible experience. I had to put something in at that time, I know their sight just recently went down or is stating that is is having problems, but that was after many complaints. I will check the book out, thanks so much for all you are doing for the dogs. All your hard research and we will get back on the positive after all I do see you are not currently promoting the company. Please accept my apologies for now bringing this to your attention but felt you needed to know and others should beaware. Thanks for leaving a comment. These were dee-lish doggie treats. i understand this company is experiencing some problems at the moment. I hope they come back to their awesome self soon. Keep up the fantastic piece of work, I read few posts on this site and I think that your site is very interesting and has got bands of superb information. Thanks for stopping by my blog and taking time to leave a comment. We always appreciate the feedback. Check back often we have lots of new stuff coming your way. Dog themed book reviews, GiveAways, etc. Wow, awesome blog layout! How long have you been blogging for? you made blogging look easy. The overall look of your web site is excellent, let alone the content!. Thanks For Your article about Product Reviews & . Thanks for taking time to stop by my blog and leave a comment. We appreciate the feedback. Check back often, we’ve got lots of cool stuff coming up. Dog themed Book Reviews, GiveAways, etc. You can also subscribe to the blog and receive one email when there is new content published. Thanks for the kind feedback. We appreciate it. Check back often. We post lots of cool stuff, GiveAways, Dog themed book and film reviews. It is pawsome reading! Wow, fantastic blog layout! How long have you been blogging for? you make blogging look easy. The overall look of your web site is great, let alone the content!. Thanks For Your article about Product Reviews & .